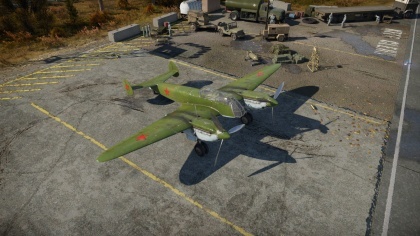 The Yak-2 KABB is a rank I Russian attacker with a battle rating of 2.3 (AB/RB) and 2.7 (SB). 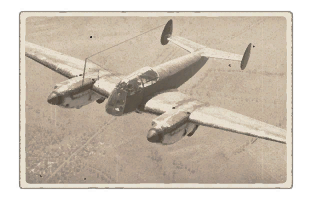 This aircraft was introduced in Update 1.75 "La Résistance". 680 320 ??? ~?? ~? 8 mm Steel plate in pilot's seat. George Mozharovsky and Ivan Venevidov (MV) were two renowned designers of aircraft armament. They specialized in developing and building many variants of reloading systems, targeting sights, weapon suspensions systems, bomb deployment mounts and the "MV" series of aircraft gun turrets. In late 1940, Mozharovsky and Venevidov invented a new type of gun mount for attack aircraft called the "комбинированной артиллерийско-бомбардировочной батареей" (Russian for "Combined artillery-bomb battery") or KABB for short which was mounted to the ventral side of the aircraft. The premise behind this gun mount was it utilized two 20-mm ShVAK cannons and two ShKAS machine guns and the cannons could be pivoted mechanically from horizontal to downside of a maximum of 30 degrees. The cannons pivoted electrically while they were connected to the K-8T gun sight which pivoted mechanically tracking with the cannons, automatically adjusting as the cannons moved. The cannons could be fixed at an intermediate position between the 0 and 30-degree range. This system allowed the pilot to maintain horizontal flight and set up for his bombing run while suppressing the target with cannon fire at the same time. Hence the name for "combined artillery-bomb battery." Installation of the KABB-MV system into the Yak-2 required significant modifications to the main fuselage and cockpit. The nose of the aircraft was removed along with part of the side panels to allow for the installation of plexiglass, significantly improving the visual field of the pilot. Bomber controls were also relocated into the pilot’s cockpit due to the navigator/bomber/gunner position being removed. Because of the installation of the fixed and movable frames of the KABB system and addition of ammunition cartridge boxes, the floor of the navigator’s cabin was removed. Tests of this new system in March to April 1941 produced favourable results, with recommendations to attach this new system to single and double-engined aircraft. Unfortunately, the German invasion in June 1941 halted all prototype work to focus on the enemy threat. This page was last edited on 7 April 2019, at 13:28.